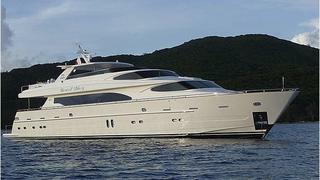 News in from Yachtzoo in Fort Lauderdale of a $1 million price cut on the 33.53m motor yacht Carnival Liberty II. Built by Horizon in 2010, she accommodates 10 guests in a master suite, two double staterooms and two twin cabins. Powered by twin 1700hp Caterpillar engines she has a cruising speed of 18 knots and a top speed of 21 knots. Lying in Osaka, Japan, Carnival Liberty II is down from $6.9 million to $5.9 million.